Full Peruvian and 3/4 Accoyo son of Gracie and Accoyo Cordero. Very crimpy bundled popcorn style fleece. Winner of several ribbons at all major regional shows icluding color champion at 2003 NAILE. Very well mannered gentle herdsire for your special female. Let A'Prentice set the standard for your next cria. 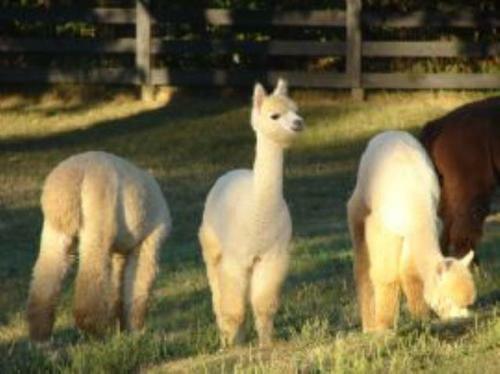 A'Prentice has several beautiful female cria on the ground.All have been show quality low micron fleece animals. He has yet to produce a male. Very Dense crimpy medium brown fleece. A "Big Mac" baby who carries on the strong boned straight confirmation of her sire. 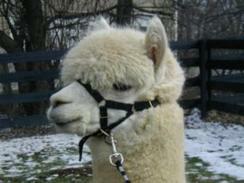 Is bred to Peruvian A'Prentice a 3/4 Accoyo white champion herdsire owned by Angelfleece Alpacas for a May 07 cria. Multiple show winner herself. News!!!! Butter Beer delivered a beautiful fine fleeced white/beige girl. Price does not include cria but a package deal can be worked out. Butter Beer will be bred to Legend's Challenger a Grey champion herdsire this fall. Angelfleece Chloe is an upright, very dense crimpy white female from our champion herdsire A'Prentice. She has great presence and stands very proud. We recommend breedingto our herdsire Angel Fleece Peruvian Pharaoh a very fine fleeced light fawn blue ribbon winning male. Chloe is co-owned with Country Cabin Alpacas.